The purpose behind powder coating is not just to provide a better finish to the metal. It is also – and most significantly – to help achieve a greater level of protection for the metal, increasing the degree of anti-corrosiveness to ensure its longest possible life. Metal pre-treatment achieves this by helping the powder coating bond more effectively, withstand weathering and prevent flash rust prior to coating. But with cleaning seen as the logical metal preparation procedure, there are some who mistakenly overlook the significance of adequately pre-treating the metal. Cleaning the metal surface is the first stage of the process. The most effective cleaning methods depend on the metal in question – for example, aluminum is prepared differently to steel because of the need to remove the oxidation layer, while castings usually need sandblasting to remove any surface rust that may have developed. Blasting – the most aggressive form of metal preparation, this involves literally blasting minute material onto the surface to strip away metal scale, rough welds, rust, and any existing coatings. It basically removes surface defects but is not so great at removing finer contaminants like oils. 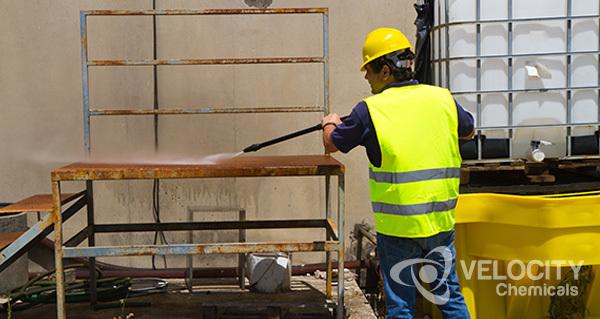 Washing – this is better suited to removing contaminant missed by blasting, with specifically formulated detergents and chemical cleaners lifting off oils, waxes and other soils before being washed away. The most common methods are pressure washing, dipping, or automatic washing, and hot water helps greatly in the process. These contaminants can impact the adhesion between the metal and the powder coating. 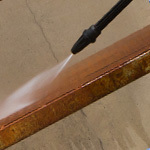 Wiping – the simplest but least efficient (unless the surface area is small), wiping a metal surface requires a solvent, a cloth and some elbow grease. The inefficiency is based on the fact the material used to wipe with tends to absorb the contaminants, thereby not completely lifting them from the surface or washing them immediately away. Once the most suitable metal cleaning method is identified, and the process undergone, then it is time to move onto the correct metal pretreatment. For example, outdoor heavy equipment is more likely to need greater protection against the elements than a piece of metal furniture. It would therefore require high-quality pretreatment process. However, decorative finishings on metal furniture may need protection against bumping and chipping, more than a common living room light stand. So, the type of metal pre-treatment needed is going to differ between them. There are 2 pretreatment processes to choose from – chemical etching and phosphating. Etching – best suited for smooth metals such aluminum, an acid-based product is administered to the surface. A carefully controlled corrosive process, chemical etching removes oxidation and causes the surface to be microscopically scarred (or etched) creating a rougher surface onto which the powder coating can cling to, thereby promoting far more effective adhesion. Phosphating – sometimes referred to as ‘phosphatizing’, this is probably the most common metal pretreatment process, chiefly because the chemicals used are easier. Like the alternative method, phosphating uses an acid-based product to attack the surface before the substrate and phosphates settle back down onto the surface. The microscopically rough surface increases adhesion, but the real benefit of the process is the high rate of corrosion resistance achieved. At Velocity Chemicals, we help our customers to identify the correct metal preparation products to match their needs. Whether they want to powder coat large outdoor machinery, such as those on a construction or mining site, or the exteriors of common delivery vehicles, the procedure is always crucial ahead of the powder coating process. ETCH FREE II – an acid based cleaner for use on acid resistant surfaces. It can be used for dip tank cleaning of aluminum or used for cleaning polished aluminum equipment and stainless steel. PREP-RITE – a heavy duty, high foaming caustic cleaner for the removal of oils, greases and light scale from metals prior to phosphate coating or painting. To find out more how Velocity Chemicals can help enhance your metal preparation process, talk to one of our specialists at 1-888-963-9499, or email us today!